Human CMV (HCMV) encodes multiple genes that control NK cell activation and cytotoxicity. Some of these HCMV-encoded gene products modulate NK cell activity as ligands expressed at the cell surface that engage inhibitory NK cell receptors, whereas others prevent the infected cell from upregulating ligands that bind to activating NK cell receptors. A major activating NKR is the homodimeric NKG2D receptor, which has eight distinct natural ligands in humans. It was shown that HCMV is able to prevent the surface expression of five of these ligands (MIC A/B and ULBP1, 2, and 6). In this article, we show that the HCMV gene product UL142 can prevent cell surface expression of ULBP3 during infection. We further show that UL142 interacts with ULBP3 and mediates its intracellular retention in a compartment that colocalizes with markers of the cis-Golgi complex. In doing so, UL142 prevents ULBP3 trafficking to the surface and protects transfected cells from NK-mediated cytotoxicity. This is the first description of a viral gene able to mediate downregulation of ULBP3. Cytomegaloviruses use a range of mechanisms to modulate cellular Ag presentation (1). They reduce levels of MHC class I on the surface of infected cells to render these cells less susceptible to lysis by MHC class I-restricted CD8+ CTLs. However, reduced surface MHC class I expression also leads to reduced inhibitory signaling by MHC-specific receptors on NK cells, which could increase susceptibility of infected cells to NK cell-mediated cytotoxicity (2). Because downregulation of Ag presentation to evade T cell responses is critical for CMV reactivation (3), CMVs have evolved mechanisms that inhibit NK cell function. NK cells can be activated through a number of pathways: by binding Ab through FcRs (4); through the action of cytokines, such as IL-2 (5); and by direct interaction with target cells. These direct interactions rely on a diverse range of receptors and ligands present on NK and target cells (6, 7). NK cells express activating and inhibitory cell-surface receptors. Activating receptors often recognize cell-surface ligands induced by the stress of infection (8) or transformation (9) and, in some cases, microbial proteins expressed at the cell surface (10, 11), whereas many inhibitory receptors bind MHC class I molecules as their ligands (12). Human CMV (HCMV), also known as human herpes virus 5, encodes multiple mechanisms to modulate NK cell responses by provision of inhibitory signals and suppression of activating signals. Two mechanisms were described by which HCMV induces inhibitory receptor signaling. In the first, the virus uses the host HLA-E pathway to inhibit NK cells through the CD94/NKG2 heterodimeric inhibitory receptor (13, 14). This pathway is usually dependent on binding peptides, derived from the classical MHC class I proteins, which stabilize HLA-E and lead to its cell-surface expression (14). Thus, reduced levels of HLA-A, -B, and -C during HCMV infection cause reduced surface expression of HLA-E and, consequently, less inhibitory signaling to NK cells. HCMV is able to promote HLA-E expression at the cell surface via the production of a viral protein UL40, which contains a monomeric peptide that binds HLA-E, thus allowing its cell-surface expression (15, 16). The second inhibitory mechanism is the expression of a viral homolog of cellular MHC class I UL18 (17). UL18 is trafficked to the cell surface with the aid of an unidentified HCMV protein (18), where it binds the inhibitory NK cell receptor LIR-1. UL18 binds LILRB1 (LIR-1) with a much higher affinity than MHC class I (19, 20), and this binding inhibits activation of LILRB1+ NK cells but not LILRB1− NK cells (21). NK cell activation can also be mediated by engagement of activating receptors with their ligands on the surface of infected or transformed cells. Of particular interest are ligands expressed in response to viral infection. HCMV encodes at least five genes that prevent the activation of NK cell receptor signaling. The pp65 tegument protein (UL83) is able to dissociate the CD3ζ signaling chain from NKp30 (22), whereas UL141 protein retains CD155 intracellularly. This reduces cell-surface levels of CD155 to prevent binding of the activating NK cell receptors CD226 and CD96 (23). The remaining viral proteins interfere with NKG2D-mediated NK cell activation. NKG2D is a major activating receptor on NK cells, expressed on all human NK cells ex vivo (24). Humans express at least eight NKG2D ligands (NKG2DLs): MICA/B, ULBP1–3, RAET1E (ULBP4), RAET1G (ULBP5), and RAET1L (ULBP6). The ligands can be expressed independently of each other but are generally poorly expressed on normal, uninfected tissues (25). Because expression of these ligands is induced by infection (26), HCMV must prevent their upregulation to minimize their effects. The viral UL16 protein binds ULBP1, 2, and 6, as well as MICB (but not the related ULBP3 and MICA) (27, 28); thus, it mediates their intracellular retention in the endoplasmic reticulum (ER) or Golgi to inhibit surface upregulation (29, 30). MICB expression is also controlled by an HCMV-encoded microRNA (UL112-1) that reduces MICB translation (31). Viral microRNAs that target MICB were also identified in EBV, HSV, and Kaposi’s sarcoma-associated herpesvirus (32). Downregulation of surface expression of the closely related MICA was also demonstrated in HCMV-infected cells mediated by UL142 protein (33) and an unidentified gene (34). HCMV expresses UL142 from the UL-b′ region, which is missing in highly passaged laboratory-adapted strains of the virus, such as AD169 (35). UL142 is a member of the UL18 gene family (36) and is predicted to have structural similarities to MHC class I, with α1 and α2 domains but no α3 domain. In addition, we previously showed that UL142 localizes to the ER and cis-Golgi (37, 38) and that transduction of UL142 is sufficient to protect cells from NK cell-mediated lysis, whereas reducing UL142 translation with RNA interference during HCMV infection increases NK cell-mediated cytotoxicity (37). UL142 can also downregulate the products of full-length alleles of MICA by intracellular retention in the Golgi complex (33, 38). Although these effects of UL142 have been proposed as the mechanism by which it exerts protection against NK cells, surface levels of truncated MICA protein (encoded by the *008 allele) were not downregulated. Interestingly, this allele is expressed by ∼66% of people in North America (39) and is the most common MICA allele in most populations studied, which led to the suggestion that UL142 may be driving the selection of certain MICA alleles in the population (40). Prevention of the cell-surface expression of NKG2DL is also observed in mouse CMV (MCMV; or MuHV-1)-infected cells. Like humans, mice have multiple NKG2DLs, including mH60, MULT-1, and molecules of the RAE-1 family; MCMV was shown to prevent cell-surface expression of all of these ligands using multiple viral gene products. The m145 gene product prevents surface expression of MULT-1: mutant MCMVs lacking this gene are attenuated in vivo (41). All known RAE-1 isoforms are downregulated by the m152 gene product (gp40), and the in vivo deficit observed following infection with an m152-deleted virus can be minimized by blocking NKG2D ligation (42). MCMV also downregulates surface levels of mH60 with the m155 gene (43) in a proteasome-dependent manner (44). Interestingly, the virus also shows a certain amount of redundancy: specifically, the m138 gene product, originally identified as a viral FcR (45), is able to downregulate expression of mH60, MULT-1 (46), and some isoforms of the RAE genes (47). The extent to which HCMV and MCMV use multiple redundant mechanisms to prevent the cell-surface expression of NKG2DLs, combined with the fact that all murine NKG2DLs are recognized by at least one MCMV protein, suggests that HCMV is also able to prevent cell-surface expression of all human NKG2DLs. rUL16 protein was shown to have no binding to ULBP3 (27) or RAET1E/ULBP4 and only very weak or marginal binding to RAET1G/ULBP5 (28, 48); therefore, no HCMV genes that are able to prevent the surface expression of ULBP3 or RAET1E/G have been described. Because UL16 and MCMV m138 (45, 46) downregulate multiple NKG2DLs, we sought to determine whether HCMV UL142 had a similar property. In this article, we show that clinical strains of HCMV are able to prevent surface expression of ULBP3. We demonstrate that UL142 interferes with cell-surface expression of ULBP3 and that expression of UL142 alone, by transduction or transfection, is able to reduce cell-surface expression of ULBP3 and cause its intracellular retention in a compartment that colocalizes with markers of the cis-Golgi. Immunoprecipitation of UL142 from ULBP3-expressing cells coprecipitates ULBP3, and reduction of cell-surface expression of ULBP3 in UL142-expressing cells is sufficient to protect cells from NK cell-mediated cytotoxicity. Human foreskin fibroblasts (HFFs) were maintained in Eagle’s MEM supplemented with 10% FCS, 2 mM l-glutamine, 105 IU penicillin/l, and 100 mg streptomycin/l (Invitrogen, Paisley, U.K.). U373 cells (an astrocytoma cell line) were maintained in the same medium, whereas 293T and HeLa-M cells were maintained in DMEM supplemented as above. Primary NK cell lines were established from PBMCs. PBMCs were prepared from fresh heparinized venous blood samples by Ficoll-Hypaque (Lymphoprep-Nyegaard, Oslo, Norway) density-gradient centrifugation. NK cells were enriched by negative depletion using MACS columns (Miltenyi Biotec, Auburn, CA). Briefly, 2 × 107 PBMCs were stained with FITC-conjugated mAbs to CD3, CD14, and CD19 (BD Biosciences, San Jose, CA), followed by anti-FITC MACS beads (Miltenyi Biotec), and separated on an LS column. The pre- and postcolumn populations were monitored by flow cytometry. The flow-through contained the negatively selected, NK-enriched population. Polyclonal NK cell lines were established by plating 2000 cells/well in 50 μl RPMI-20 (RPMI 1640 plus 10% human AB serum and 10% FCS; Life Technologies) in 96-well U-bottom microtiter plates (Costar, Corning, Corning, NY). Each well was stimulated with 50 μl a mixture of 50 U/ml recombinant human IL-2 (National Institute of Biological Standards and Control, Potters Bar, U.K.), 25,000 irradiated allogenic EBV-transformed B cell lines, and 25,000 irradiated autologous PBMCs. Plates were incubated at 37°C with 5% CO2 and fed with 50 μl RPMI-20 plus 50 U/ml recombinant human IL-2 on days 5 and 10. Polyclonal lines were established after 2 wk in culture and were maintained by feeding with 50 μl RPMI-20 plus 50 U/ml rIL-2 every 5 d.
3xFLAG-tagged ULBP3 (denoted FLAG-ULBP3) was a gift from Richard Apps and Ashley Moffett (Department of Pathology, University of Cambridge) (49), and 3xFLAG-tagged ULBP2 (FLAG-ULBP2) was constructed as described previously (50). N-terminal GFP-tagged UL142 was constructed as described previously (38). All plasmids were prepared using a Nucleobond Maxi Xtra method (Machery Nagel, Düren, Germany) and resuspended in Tris-EDTA or water. N-terminal GFP-tagged ULBP2 and ULBP3 were constructed in a pcDNA3-based expression vector described previously (51). HCMV strains AD169 (ATCC VR-538) and TB40/e (gift of Christian Sinzger, University of Tübingen, Tübingen, Germany) were grown in HFFs. Briefly, confluent 150-cm2 flasks of HFFs were washed once with PBS and infected with virus at a multiplicity of infection (MOI) of 0.1. One hour later, fresh tissue culture media was added, and the infected cells were incubated at 37°C in 5% CO2. Four days later, when >90% of the cells were showing signs of cytopathic effect (CPE), the tissue culture supernatant was harvested and replaced with fresh media. This was repeated daily until the cell monolayer was destroyed. The virus supernatants from each harvest were aliquoted and frozen at −70°C. An aliquot from each time point was used to infect a 25-cm2 tissue culture flask of HFFs, and CPE was assessed 24 h later. Viral stocks demonstrating >90% CPE were retained, and viral titer was determined by plaque assay. Recombinant adenoviruses (RAds) expressing UL142 and GFP or a control RAd expressing GFP alone (37) were gifts of Peter Tomesec and Gavin Wilkinson (University of Cardiff, Heath Park, Cardiff, U.K.). U373 cells were infected at an MOI of 50, and HeLa-M cells were infected at an MOI of 20; both cell types were incubated for 24–96 h.
Cells were harvested by trypsinization or in cell-dissociation media (Sigma-Aldrich, St. Louis, MO), and ∼106 cells were pelleted in FACS tubes (Falcon). Cells were washed in PBS, resuspended, and stained using rPE-conjugated anti-MHC class I (BD Biosciences, San Jose, CA) or anti-ULBP2 (R&D Systems, Minneapolis, MN), anti-ULBP3 (R&D Systems), or anti-MICA (Santa Cruz Biotechnology, Santa Cruz, CA) and an Alexa Fluor 647-conjugated anti-mouse secondary layer, where required (Invitrogen). Cells were washed in PBS, fixed in 2% paraformaldehyde, and analyzed on a FACSCalibur instrument (BD Biosciences). Plots were generated using WinMDI2.9 (Scripps Research Institute, La Jolla, CA). Targets consisted of HeLa-M cells in six-well plates that were untransfected, cotransfected with FLAG-ULBP3 and FLAG-UL142, or cotransfected with FLAG-ULBP3 and pcDNA3. Transfections were carried out using Fugene6 (Roche, Basel, Switzerland). Twenty-four hours posttransfection, cells were washed once in PBS and harvested by trypsinization (Sigma-Aldrich). K562 cells were used as a positive control for NK cell cytotoxicity. 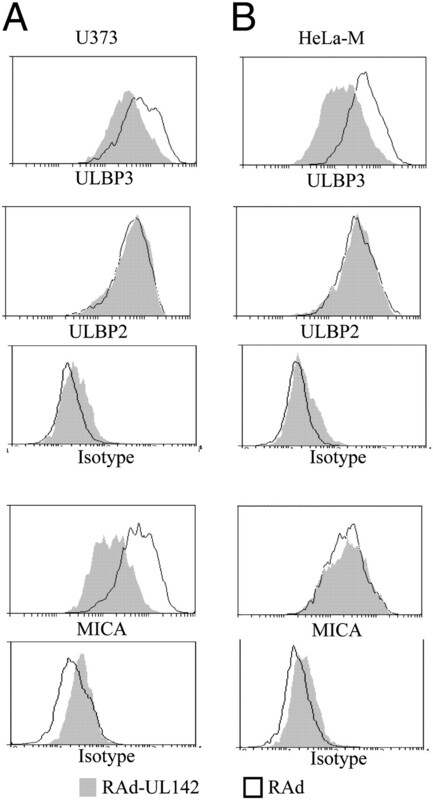 Surface levels of ULBP3 were assessed by flow cytometry. Target cells were loaded with [51Cr] (sodium chromate; Amersham Biosciences, Piscataway, NJ and/or PerkinElmer, Wellesley, MA), incubated at 37°C for 45 min, and then washed three times in RPMI-10. Primary human polyclonal NK cells and 51Cr-labeled target cells were mixed in 96-well U-bottom plates in quintuplicate at different E:T ratios and incubated for 5 h at 37°C, 5% CO2. Supernatants were harvested with a Biomek-1000 robot (Beckman Coulter, High Wycombe, U.K.), radioactive counts were determined using a γ counter (COBRA, Packard Instrument, Meriden, CT), and the percentage specific lysis was calculated. HeLa-M cells were grown on glass coverslips (VWR International, Leicestershire, U.K.). Cells were cotransfected with 3xFLAG vector, 3xFLAG-UL142 and GFP-ULBP2, or GFP-ULBP3 using Fugene6. Cells were incubated for 16 h, fixed in 4% paraformaldehyde for 30 min, and permeabilized in 0.1% Triton X-100. Cells were stained with rabbit anti-FLAG (Sigma-Aldrich) and a mouse anti-gM130, anti-p230, or the IgG1 isotype control Ab (all from BD Biosciences). Then, cells were stained with Alexa Fluor 647-conjugated anti-mouse IgG and Alexa Fluor 568-conjugated anti-rabbit IgG (both from Invitrogen). All coverslips were mounted in antifade gold (Invitrogen) and visualized using a confocal microscope (Leica TCS SP, Leica Microsystems, Deerfield, IL); images were analyzed using ImageJ software (National Institutes of Health, Bethesda, MD). HeLa-M cells were transfected as for immunofluorescence microscopy. Fourteen hours after transfection, the cells were incubated at 4°C, stained with mouse anti-CD71 (eBioscience, Hatfield, U.K.), and mouse anti-ULBP3 or anti-ULBP2 (both from R&D Systems) was added for 30 min in ice-cold PBS. Cultures were washed five times with PBS and incubated at 37°C in prewarmed DMEM-10 for 2 h. Cells were fixed in 4% paraformaldehyde for 30 min and stained using anti-FLAG to detect FLAG-UL142, as well as an Alexa Fluor 647-conjugated anti-mouse secondary Ab to detect internalized mouse Abs. 293T cells were cotransfected with GFP-tagged UL142 and 3xFLAG-tagged ULBP2 or GFP-tagged UL142 and 3xFLAG-tagged ULBP3. At 16 h posttransfection, GFP+ transfected cells were isolated by cell sorting. Samples for input controls were removed and analyzed by Western blot using anti-ULBP2 and ULPB3, Abs as described below; cells were then lysed in buffer containing 50 mM Tris-Cl [pH 8], 200 mM NaCl, 200 mM Na3VO4, 10 mM NaF, 0.5% Nonidet P-40, and 50 mM PMSF with 40 mg/ml BSA, and cell membranes and nuclei were removed by centrifugation. Lysates were precleared with an isotype-control Ab (R&D Systems) and protein A-Sepharose and were immunoprecipitated using anti-GFP (Roche) or isotype control (R&D Systems). Beads were washed, and proteins were eluted by boiling in Laemmli buffer and analyzed by Western blot. Protein samples were separated by SDS-PAGE and transferred to HiBondC nitrocellulose membranes. Membranes were blocked with 5% nonfat milk protein in 0.1% Tween-20 in PBS, and proteins were detected with anti-ULBP3 (R&D Systems AF1517; 1:50) or anti-ULBP2 (R&D Systems AF1298; 1:50), followed by HRP-conjugated species-specific secondary Abs (Dako). HRP signal was detected using an ECLPlus (Amersham Biosciences) chemiluminescent HRP substrate and x-ray film (Kodak, Rochester, NY). Infection of fibroblast cell lines with HCMV strain AD169 was shown to induce MICA, MICB, and ULBP1–3 mRNA expression (26). At the protein level, MICB, ULBP1, and ULBP2 were not expressed at the cell surface, but ULBP3’s cell-surface expression was markedly increased by AD169 infection (52). The highly passaged HCMV strain AD169 has a number of genetic differences compared with low-passage clinical isolates of HCMV, including an ∼13–15-kb deletion, termed the UL-b′ region (35, 53). To investigate the effects of different strains of HCMV on cell-surface expression of ULBP3, HFF cells were infected with AD169 or the low-passage clinical strain TB40e. Uninfected and infected cells (24, 48, 72, and 96 h postinfection) were stained with anti-ULBP3 and anti-MHC class I Abs and analyzed by flow cytometry. Reduced MHC class I surface expression was used as a marker of HCMV infection, and these infected cells were gated and analyzed for ULBP3 expression; cells were also stained with isotype-matched control Ab, which was negative in all cases. In agreement with a previous analysis (52), uninfected HFFs did not express ULBP3 on their cell surface; however, by 72 h postinfection with HCMV strain AD169, increased ULBP3 cell-surface expression was detected. In contrast, cells infected with HCMV strain TB40e did not express ULBP3 on the cell surface at any time point postinfection (Fig. 1). The results demonstrated that clinical strains of HCMV are able to prevent ULBP3 cell-surface expression. Because the major difference between AD169 and TB40e virus strains is the deletion of UL-b′, these results further suggested that a gene in this genomic region is able to mediate this function. ULBP3 expression after HCMV infection. HFF cells infected with the HCMV strain AD169 expressed increasing levels of ULBP3 at the cell surface with increasing time postinfection, but ULBP3 was not expressed on the surface of cells infected with the HCMV strain TB40e. HFF cells were infected with HCMV strain AD169 or the low-passage strain TB40e for 24, 48, 72, or 96 h. The cells were stained with anti-ULBP3 and anti-MHC class I Abs and analyzed by flow cytometry. Infected cells were identified by gating for reduced surface expression of MHC class I and then ULBP3 expression and isotype controls were analyzed. The UL-b′ region encodes at least two genes (UL141 and UL142) that modulate the NK cell response (23, 37). UL141 downregulates levels of CD155 from the surface of infected cells, thus preventing binding of the CD96 and CD226 activating receptors on NK cells (23). Although it was demonstrated that UL142 is able to decrease cell-surface expression of full-length alleles of MICA (33, 38), and because HCMV UL16 is able to interact and prevent cell-surface expression of multiple NKG2DL, we hypothesized that UL142 might also prevent ULBP3 cell-surface expression. To determine whether UL142 in isolation was able to prevent expression of ULBP3 at the cell surface, we used RAds expressing UL142 and GFP or a control adenovirus expressing GFP alone. U373 and HeLa-M cells were transduced with the RAds. U373 cells are homozygous for the full-length MICA allele *001, whereas HeLa-M cells are homozygous for the truncated allele *008. At 96 h posttransduction, cell-surface levels of MICA, ULBP2, and ULBP3 were determined by staining with Ab and analyzed by flow cytometry; cells were also stained with isotype-matched control Ab, which was negative in all cases. HeLa-M and U373 cells expressing UL142 exhibited decreased cell-surface expression of ULBP3 compared with cells transduced with the control adenovirus (Fig. 2). As previously reported (38), expression of UL142 in U373 cells led to decreased cell-surface expression of the full-length MICA allele *001 (Fig. 2A). However, UL142 expression had no effect on cell-surface expression of the truncated allele MICA*008 in HeLa-M cells (Fig. 2B), as expected. The cell-surface expression of the NKG2DL ULBP2 was not affected by UL142 expression in either cell line, providing an important negative control. Decreased cell-surface expression of ULBP3 in U373 or HeLa-M cells expressing UL142. U373 or HeLa-M cells expressing UL142 have decreased cell-surface expression of ULBP3. A, U373 cells transduced with RAd UL142 (RAd expressing UL142 and GFP) or RAd (control adenovirus expressing GFP alone) were stained for surface expression of ULBP3, ULBP2, an isotype control and MICA, or an isotype control. U373 expresses the full-length MICA allele *001, which is downregulated by UL142. As expected, ULBP2 was unaffected by UL142 expression; however, ULBP3 surface expression was decreased. B, The experiment was repeated using HeLa-M cells, which express the truncated MICA allele *008. As expected, ULBP2 and MICA*008 were unaffected by UL142 expression; however, surface expression of ULBP3 was downregulated. Although UL142 in isolation is able to downregulate surface levels of ULBP3, we noted that TB40e was able to control ULBP3 levels at early times (24–48 h) during infection, before UL142 expression began at 72 h postinfection (37). This suggests that HCMV encodes at least one additional gene in the UL-b′ region that downregulates surface levels of ULBP3. This meant that the use of a UL142 knockout virus to test the importance of UL142 during infection was not feasible, because any phenotype might be masked by the presence of the unidentified second gene. Therefore, we expressed UL142 in cells infected with the AD169 strain of virus to attempt to rescue the AD169 phenotype to that of TB40e infection. HFFs were transduced with RAd expressing UL142 and GFP (or a control adenovirus expressing GFP alone) and were infected with AD169 24 h later. Surface levels of ULBP3 were determined by flow cytometry; cells were also stained with isotype-matched control Ab. As expected, AD169 infection caused upregulation in the levels of surface ULBP3 compared with uninfected control cells. 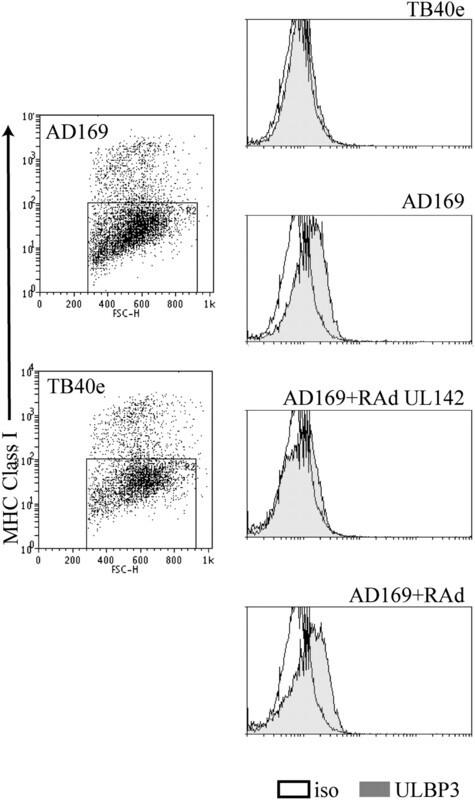 Transduction of AD169-infected cells with the control adenovirus showed that the RAd had no intrinsic effect on surface levels of ULBP3. Transduction of AD169-infected cells with adenovirus expressing UL142 prevented surface expression of ULBP3 (Fig. 3). UL142 expression in HCMV strain AD169-infected cells substantially reduced surface ULBP3 expression. HFF cells were transduced with adenovirus expressing UL142 or a control adenovirus. After 24 h, cells were infected with HCMV AD169 and incubated for an additional 24 h. Then cells were stained with anti-ULBP3 and anti-MHC class I Abs and analyzed by flow cytometry. Infected cells were identified by gating on cells with reduced surface expression of MHC class I and then surface expression of ULBP-3 was analyzed. UL16 mediates decreased surface expression of MICB and ULBP1, 2, and 6 by intracellular retention in the ER or cis-Golgi (27, 28). More recently, we showed that UL142 similarly retains full-length alleles of MICA in the cis-Golgi (38). To determine whether UL142 prevented cell-surface expression of ULBP3 via a similar mechanism, we investigated the cellular localization of ULBP3 in the presence of UL142. Because no Abs recognizing endogenous/untagged UL142 were available, we used an N-terminal FLAG-tagged UL142 construct that we previously showed was able to mediate intracellular retention of full-length alleles of MICA (38). HeLa-M cells were cotransfected with FLAG-UL142 or the empty FLAG vector control and a GFP-tagged ULBP3 or GFP-tagged ULBP2 construct. The cells were stained with Abs to the FLAG tag (to visualize UL142) and Golgi markers and then analyzed by immunofluorescence microscopy. The results show that in the absence of UL142, ULBP2 and ULBP3 were expressed at the cell surface in all transfected cells (Fig. 4A). Unsurprisingly, some of these cells also showed limited colocalization between GFP-ULBP2/3 and markers of the cis- (GM130) and trans- (p230) Golgi complex (data not shown), presumably as a result of normal ULBP2/3 trafficking via the Golgi complex to the cell surface. Intracellular accumulation of ULBP3 in cells coexpressing ULBP3 and UL142. A, Cells transfected with GFP-ULBP2 or GFP-ULPB3 showed cell surface expression of both proteins. Original magnification ×132 (left), ×130 (right). B, Cells cotransfected with GFP-ULBP3 and FLAG-UL142 did not express ULBP3 at the cell surface; however, cells cotransfected with ULBP2-GFP and UL142 still expressed surface ULBP2. Original magnification ×126. Cells that coexpressed FLAG-UL142 and GFP-ULBP3 lacked any cell-surface expression of ULBP3. 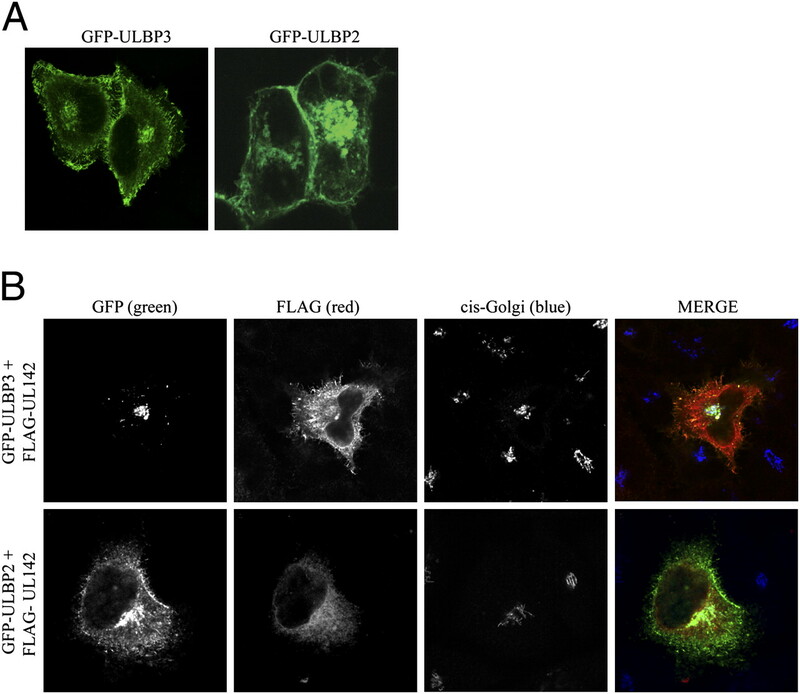 Instead, GFP-ULBP3 was detected in an intracellular compartment that exhibited extensive colocalization with the marker of the cis-Golgi (GM130) (Fig. 4B). When expressed in isolation, most FLAG-UL142 proteins predominantly colocalized with markers of the ER (38), whereas in FLAG-UL142/GFP-ULBP3–cotransfected cells, FLAG-UL142 and GFP-ULBP3 were detected in the cis-Golgi (Fig. 4B). We also cotransfected FLAG-UL142 with GFP-ULBP2 as a control; in this case (Fig. 4B), ULBP2 was expressed at the cell surface in all cotransfected cells. 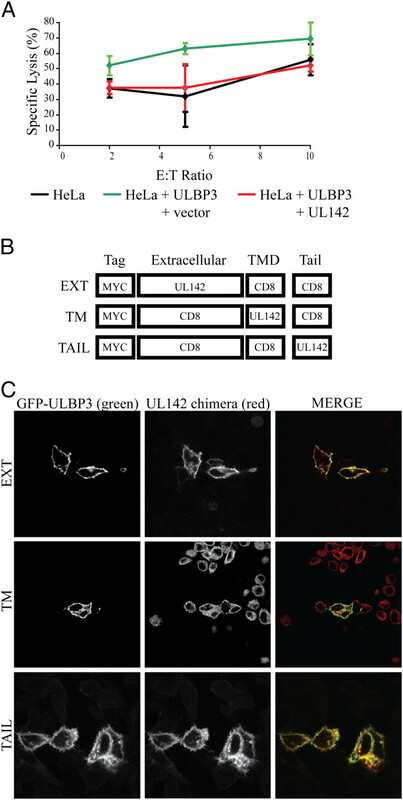 These results suggested that UL142 interfered with the normal trafficking of ULBP3 to the cell surface by intracellular retention in the Golgi complex. UL16 directly interacts with ULBP1/2/6 and MICB to prevent the surface expression of these NKG2DLs (27–30). Consequently, it was possible that UL142 mediates intracellular retention of ULBP3 by a direct interaction. This hypothesis is supported by the fact that GFP-ULBP3 and FLAG-UL142 are localized to the cis-Golgi in cotransfected cells. To address this, immunoprecipitations were carried out on lysates of 293T cells cotransfected with GFP-UL142 and FLAG-ULBP3 or GFP-UL142 and FLAG-ULBP2. At 16 h posttransfection, transfected cells were separated into GFP+ and GFP− populations using flow cytometric cell sorting. Some of the cells from each of these populations were used for Western blot as input controls for ULBP2 and ULBP3; the results showed that both populations had about the same amount of these proteins. Lysates were made from the rest of each population, and immunoprecipitations were carried out using an anti-GFP Ab (to precipitate GFP-UL142) or an isotype-control Ab and protein A-Sepharose. Eluted proteins were denatured, run on an SDS-PAGE gel, and analyzed by Western blotting using anti-ULBP3 or ULBP2 Abs. FLAG-ULBP3, but not FLAG-ULBP2, coprecipitated with GFP-UL142 (Fig. 5), thus demonstrating that UL142 associates with ULBP3 but not with ULBP2. However, this does not preclude that the interaction between UL142 and ULBP3 is an indirect one, requiring the involvement of another protein. ULBP3 coprecipitated with UL142 from cotransfected cells. 293T cells were cotransfected with either GFP-UL142 and FLAG-ULBP3 or GFP-UL142 and FLAG-ULBP2. 16 h post transfection, cells were separated into GFP positive and negative populations by cell sorting. Lysates were made from the two separate populations. Immunoprecipitations were carried out using either an anti-GFP Ab (to precipitate GFP-UL142) or an isotype control Ab, and Protein A Sepharose. Eluted proteins were denatured and analyzed by western blot using anti-ULBP3 or ULBP2 Abs. Input protein, some of the GFP positive and negative cell populations were lysed and directly analyzed by western blot using both the ULBP2 and ULBP3 Abs. Our results showed that UL142 downmodulates expression of ULBP3 at the cell surface, leading to intracellular retention of the NKG2DL in the cis-Golgi (Fig. 4). Two mechanisms are possible: UL142 prevents trafficking of nascent ULBP3 to the cell surface or UL142 mediates internalization of cell surface ULBP3. To determine the mechanism by which UL142 downmodulates surface expression of ULBP3, Ab-internalization assays were carried out to determine whether ULBP3 traffics to the cell surface in the presence of UL142. At 14 h posttransfection, HeLa-M cells transfected with FLAG-ULBP2 or FLAG-ULBP3 (with or without GFP-UL142) were incubated with mouse anti-ULBP3 or anti-ULBP2 Ab for 30 min at 4°C. Cells were incubated at 37°C for an additional 2 h (for protein internalization to occur) and then fixed, permeabilized, and stained with rabbit anti-FLAG Ab. This was followed by incubation with anti-mouse Ab (to visualize internalized ULBP2/3) and anti-rabbit Ab (to visualize noninternalized ULBP2/3). Cells transfected with FLAG-ULBP3 alone showed clear internalization of surface ULBP3 (Fig. 6A). However, in cells cotransfected with GFP-UL142 and FLAG-ULBP3, FLAG-ULBP3 was absent from the cell surface, and no Ab internalization was observed (Fig. 6A). To show that UL142 did not mediate a nonspecific block on retrograde trafficking, internalization of ULBP2 and the transferrin receptor CD71 was assessed. 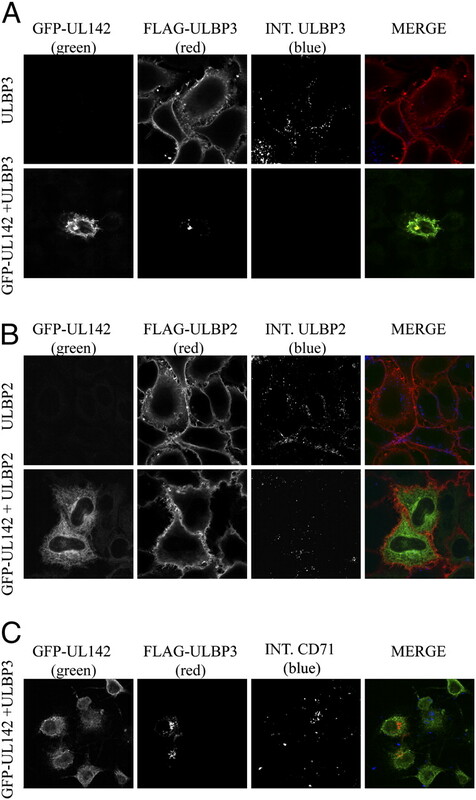 Cells expressing FLAG-ULBP2, in the presence or absence of GFP-UL142, exhibited internalization of FLAG-ULBP2 (Fig. 6B). In addition, internalization of CD71 was observed in cells cotransfected with GFP-UL142 and FLAG-ULBP3 (Fig. 6C), thus demonstrating that UL142 did not mediate a global block on retrograde transport. The results suggest that de novo synthesized ULBP3 was prevented from leaving the Golgi and, thus, was unable to traffic to the cell surface. UL142 retains ULBP3 in the cis-Golgi by preventing trafficking to the cell surface. A, HeLa-M cells were transfected with FLAG-ULBP3 alone or in conjunction with GFP-UL142. Fourteen hours posttransfection, transfected cells were incubated with mouse anti-ULBP3 Ab for 30 min at 4°C and an additional incubation at 37°C for 2 h (by which time intracellular accumulations of ULBP3 could be observed). Cells were fixed, permeabilized, and stained with anti-FLAG Ab to visualize noninternalized ULBP3. This was followed by staining with an anti-mouse Ab to visualize cell-surface–internalized Ab and, thus, ULBP3. Cells transfected with FLAG-ULBP3 alone showed internalization of surface ULBP3; however, no internalization was observed in cells cotransfected with GFP-UL142 and FLAG-ULBP3. Original magnification ×113 (top), ×76 (bottom). B, As a control, HeLa-M cells were transfected with FLAG-ULBP2 alone or in conjunction with GFP-UL142. Cells that expressed ULBP2 in the presence or absence of UL142 showed internalization of ULBP2. Original magnification ×113. C, Cells cotransfected with GFP-UL142 and FLAG-ULBP3 and stained with anti-transferrin receptor CD71 also showed CD71 internalization. Original magnification ×76. NK cell cytotoxicity can be induced by signaling via the NKG2D receptor. The UL142-mediated loss of ULBP3 on the surface of a target cell should reduce the ability of NK cells to lyse the target cell. To test this, we carried out NK cell cytotoxicity assays using HeLa-M cells. These were used as target cells because they do not express the NKG2DLs ULBP1/2/3 (data not shown) and only express low levels of the short allele of MICA, with which UL142 is unable to interact (38); as such, we could transfect the cells with ULBP3, to induce higher levels of cytotoxicity, and cotransfected cells with ULBP3 and UL142, which should reduce cytotoxicity to background levels. HeLa-M cells were cotransfected with FLAG-ULBP3 and pcDNA3 alone or FLAG-UL142 as target cells against primary polyclonal human NK cells. As predicted, transfection of HeLa-M cells with FLAG-ULBP3 led to an increase in NK cell-mediated lysis of these target cells compared with untransfected HeLa-M cells. However, cotransfection of HeLa-M cells with FLAG-ULBP3 and FLAG-UL142 reduced the level of target cell lysis to that of untransfected HeLa-M cells (Fig. 7A). UL142-mediated downregulation of ULBP3 surface expression protects against NK cell-mediated lysis. A, NK cytotoxicity assays were carried out using HeLa-M cells transfected with ULBP3 alone or in conjunction with UL142 as target cells against a primary polyclonal human NK cells. Lysis of HeLa-M cells cotransfected with ULBP3 and UL142 was comparable to that of untransfected HeLa-M cells. All domains of the UL142 protein were required for intracellular retention of ULBP3. B, Three chimeras consisting of domains of UL142 and CD8 were constructed. Chimera EXT is a CD8 chimera consisting of the UL142 luminal domain. Chimera TM consists of the UL142 transmembrane domain, whereas chimera TAIL consists of the UL142 tail domain. C, HeLa-M cells were cotransfected with GFP-ULBP3 and a CD8-UL142 chimera and then analyzed by immunofluorescence microscopy. None of the CD8-UL142 chimeras was able to mediate intracellular retention of ULBP3. Original magnification ×88 (top), ×63 (middle), ×96 (bottom). Previous work using UL142-CD8 chimeric proteins demonstrated that UL142 protein is localized to the ER and cis-Golgi by the UL142 transmembrane domain (38). Using these same chimeras in cotransfection experiments, it was also demonstrated that the UL142 luminal domain is involved in intracellular retention of full-length MICA alleles (38). We showed that ULBP3 coprecipitates with UL142 (Fig. 5). This suggested that an association between UL142 and ULBP3 (directly or via a third-party protein) leads to intracellular retention of the NKG2DL. Consequently, we used the chimeric CD8-UL142 constructs (Fig. 7B) to determine which domains of UL142 were involved in the retention of ULBP3 in the cis-Golgi. HeLa-M cells cotransfected with GFP-ULBP3 and a Myc-tagged CD8-UL142 chimera were analyzed by immunofluorescence microscopy (Fig. 7B, 7C). None of the CD8-UL142 chimeras were able to mediate intracellular retention of GFP-ULBP3. This showed that the cis-Golgi retention ability of UL142 cannot be ascribed to any single domain of the UL142 protein. The HCMV gene UL16 is able to mediate the intracellular retention of four different NKG2DLs (ULBP1/2/6 and MICB) (27, 28, 30, 52), whereas UL142 is known to mediate the intracellular retention of a fifth NKG2DL (full-length alleles of MICA) (33, 37, 38). Therefore, it seemed surprising that no mechanism for the control of ULBP3 expression had been described, especially because MCMV is able to interfere with the cell-surface expression of all of the murine NKG2DLs. Thus, it seemed inherently plausible that ULBP3 would be controlled in HCMV-infected cells and also possible that UL142 could downmodulate expression of other NKG2DL(s), as is the case with UL16. In this study, we showed that HCMV-infected cells can downregulate surface levels of ULBP3, that only wild-type virus has this property, and that the laboratory-adapted strain AD169, missing the UL-b′ region, is unable to control ULBP3 surface expression. We also demonstrated that ULBP3 downregulation is mediated by UL142, a gene that is located in this UL-b′ region. UL142 is unable to downmodulate mature ULBP3 from the cell surface; instead, it promotes retention of nascent ULBP3 protein in the cis-Golgi, thereby preventing trafficking of the NKG2DL to the cell surface. UL142 also specifically coprecipitates with ULBP3, consistent with there being a protein–protein interaction. The downregulation of cell-surface ULBP3 induced by UL142 expression was sufficient to protect cells from NK cell-mediated cytotoxicity. Downregulation of MHC class I (“missing self”) and the induction of ligands of activating NKRs (“stressed self”) are features of many viral infections, including HCMV. These strategies should render HCMV-infected cells susceptible to NK cell-mediated cytotoxicity. However, to counter this, HCMV encodes at least eight functions that modulate NK cell responses (54). Although some of these mechanisms operate by providing inhibitory signals to NK cells to compensate for the lack of MHC class I on the cell surface of infected cells, the majority prevent NK cell activation by interfering with cellular ligands for activating receptors on the NK cell. One of the major activating receptors on NK cells is the homodimeric NKG2D. Human NKG2D has at least eight ligands (ULBP1-6 and MICA/B), and HCMV infection results in upregulated transcription of all of these ligands, with the exception of ULBP4 (26, 28). Ligation of NKG2D by its ligands provides a strong activating signal via the associated DAP10 adaptor that can override the inhibitory signals mediated by engagement of inhibitory NK cell receptors (55). Consequently, survival of HCMV-infected cells would require viral modulation of the expression of all induced NKG2DLs. HCMV is particularly adept at minimizing NK cell activation through the NKG2D pathway, with at least four viral genes (UL16, UL142, UL112-1, and an unidentified gene) (27, 28, 30, 31, 33, 34, 37, 38, 52) combining to prevent expression of MICA/B and ULBP1/2/6 at the cell surface. With so many mechanisms already identified, it seems possible that HCMV is particularly susceptible to NKG2D-mediated responses, a hypothesis supported by evidence from mouse models in which MCMV is the only virus known to downregulate all ligands of murine NKG2D (41–47). The NKG2DL MICA and MICB proteins are highly related in their α1/2 domains (sharing 83% amino acid identity) and are more distantly related to ULBP1–6, yet UL16 binds to MICB (but not MICA) and to ULBP1/2/6 (but not ULBP3/4). A recent structural analysis identified a small number of amino acids on UL16 that mimics an area on NKG2D that interacts with its ligands. Critically, NKG2DLs that bind UL16 have a glutamine or glutamate at position 169. Ligands, such as MICA and ULBP3, which have an arginine at this position, are not bound by UL16 (56). Thus, it was suggested that UL16 expression provides evolutionary pressure by which viral immune evasion genes, such as UL16, can drive diversification of the ligands for NKG2D to the benefit of the host. Equally, as our data support, the virus is driven to evolve other viral genes (UL142) to prevent the expression of NKG2DLs that have escaped control by UL16. MICA and ULBP3 possess MHC I-like α-1/2 extracellular domains but with notable differences. ULBP3 is predicted to have a cell-surface attachment via a GPI anchor, whereas MICA contains a transmembrane domain (55). UL142 can downmodulate cell-surface expression of the full-length MICA allele but not the truncated allele *008. These two alleles of MICA have a very high sequence identity, except for a premature stop codon that truncates the transmembrane domain and tail of MICA*008. This suggests that UL142 must, at least in part, recognize MICA in this region, although the extracellular, transmembrane, and tail region of UL142 were all required to prevent surface expression of full-length MICA (38). A similar analysis of the UL142 domains that might interact with ULBP3 (Fig. 7) again showed that none of the UL142 domains in isolation were able to prevent the surface expression of ULBP3. UL142 resides in the ER as a property of its transmembrane domain until it interacts with a newly synthesized MICA or ULBP3 molecule. However, because intracellular retention of ULBP3 or MICA is reliant on the UL142 luminal domain, it seems likely that there is an interaction between the UL142 luminal domain and the external domain of ULBP3 and MICA. It remains unclear how UL142 is able to bind and retain the disparate MICA and ULBP3 but not ULBP2, which is more closely related to ULBP3 than MICA. There is little sequence identity between the external domains of MICA and ULBP3; however, the recent structural analysis of the interaction of UL16 with various NKG2DLs highlighted that interaction can depend on a small number of critical residues (56). The data presented in this study, and the fact that ULBP3 is less polymorphic than MICA (for which ≥70 alleles have been identified) (39, 57), suggest that downregulation of surface ULBP3 may represent the major mechanism by which UL142 protects infected cells from NK cell cytotoxicity. Our results also suggest that HCMV encodes at least one additional gene that downmodulates surface expression of ULBP3 at early times postinfection. Our previous work showed that UL142 is expressed from 72 h postinfection (37). Interestingly, when ULBP3 expression is measured from 24–96 h postinfection with AD169 and TB40e virus strains, it is expressed on the cell surface by 48 h following infection by AD169 but not by TB40e (Fig. 1A). Because UL142 is not expressed at this time, we propose that at least one more gene in the UL-b′ region of HCMV is able to downregulate surface levels of ULBP3. This would mean that ULBP3, MICA, and MICB are each downregulated by at least two genes in HCMV. This has parallels with HCMV-mediated interference with the MHC class I pathway: the virus encodes multiple genes (Us 2, 3, 6 and 11) that can interfere with normal MHC class I processing and presentation, and these genes are expressed at different points in the viral life cycle (58). The presence of multiple viral modulators of some NKG2DLs raises the question of whether there is a hierarchy of importance. Perhaps those proteins modulated by two or more viral genes are better activators of NKG2D; it was shown that mouse and human NKG2DL have different binding affinities for NKG2D (59–61). Alternatively, it is possible that multiple NKG2DLs exist to provide the host with a range of mechanisms to distinguish different cell types and tissues and infecting agents. Because HCMV infects a range of cells and tissues, it is possible that the relative importance of each NKG2DL may be more reliant on the location of its expression than on its ability to activate NK cells. Upon infection, a variety of viruses was shown to induce upregulation of cell-surface NKG2DL; subsequently, many of these were shown to encode NKG2DL-associated evasion proteins (62–66). Until now, no viral mechanism able to downregulate ULBP3 has been described. Human cells encode at least eight NKG2DLs; HCMV has now been shown to encode genes that interfere with six of these (MICA, MICB, ULBP1, ULBP2, ULBP3, and ULBP6), leaving two additional ligands, ULBP4 and ULBP5. It was shown that ULBP4 mRNA expression is not induced by HCMV infection of fibroblasts and that UL16-Fc does not bind ULBP4 (28); it is possible that this NKG2DL is not involved in immunity to HCMV. Cell-surface–expressed ULBP5 is bound by UL16-Fc, although much more weakly than the closely related ligands ULBP2 and ULBP6 (28); however, it has not been formally demonstrated that ULBP5 is prevented from being expressed on the cell surface during HCMV infection. The importance of HCMV modulation of multiple NKG2DLs might not be solely related to viral evasion of NK cell responses, because NKG2D receptor expression is not restricted to NK cells. In humans, NKG2D is also expressed on all CD8+ and γδ T cells and on some CD4+ T cells, where it functions as a costimulatory molecule (67), and it may also induce TCR-independent killing (68). More recently, it was shown that some dendritic cell subsets express NKG2D and that signaling via the receptor can also induce target cell killing (IFN-producing killer dendritic cells (69, 70). It is also recognized that human dendritic cells subsets display cytotoxic potential through a variety of stimuli and effector mechanisms (69). Taking into account all of the evidence, the multiple mechanisms that HCMV has evolved to prevent infected cells displaying ligands for NKG2D, although clearly important for preventing NK cell activation and cytotoxicity mediated through this receptor, also seem likely to be important as a broader strategy to interfere with innate and acquired immune responses to the virus. We thank Professor John Sinclair, Dr. Emma Poole, and Dr. Michael Gill for useful discussions. This work was supported by Wellcome Trust Grant 079591/Z/06/Z.
. 2007. Modulation of HLA expression in human cytomegalovirus immune evasion. Cell. Mol. Immunol. 4: 91–98.
. 1990. In search of the ‘missing self’: MHC molecules and NK cell recognition. Immunol. Today 11: 237–244.
. 2006. Coordinated function of murine cytomegalovirus genes completely inhibits CTL lysis. J. Immunol. 177: 3225–3234.
. 1975. Human antibody-dependent cellular cytotoxicity. Isolation and identification of a subpopulation of peripheral blood lymphocytes which kill antibody-coated autologous target cells. J. Clin. Invest. 56: 1580–1586.
. 1983. Interleukin 2 dependence of human natural killer (NK) cell activity. J. Immunol. 130: 1970–1973.
. 2001. Human natural killer cell function and receptors. Curr. Opin. Pharmacol. 1: 387–391. 2008. Natural killer cell receptors. Adv. Exp. Med. Biol. 640: 35–52.
. 2003. Stress management: MHC class I and class I-like molecules as reporters of cellular stress. Immunity 19: 469–477.
. 1999. Broad tumor-associated expression and recognition by tumor-derived gamma delta T cells of MICA and MICB. Proc. Natl. Acad. Sci. USA 96: 6879–6884.
. 2001. Murine cytomegalovirus is regulated by a discrete subset of natural killer cells reactive with monoclonal antibody to Ly49H. J. Exp. Med. 194: 29–44.
. 2001. Susceptibility to mouse cytomegalovirus is associated with deletion of an activating natural killer cell receptor of the C-type lectin superfamily. Nat. Genet. 28: 42–45.
. 1996. Receptors for HLA class-I molecules in human natural killer cells. Annu. Rev. Immunol. 14: 619–648.
. 1998. HLA-E is the ligand for the natural killer cell CD94/NKG2 receptors. J. Biomed. Sci. 5: 321–331.
. 2000. Surface expression of HLA-E, an inhibitor of natural killer cells, enhanced by human cytomegalovirus gpUL40. Science 287: 1031.
. 2000. Cutting edge: the human cytomegalovirus UL40 gene product contains a ligand for HLA-E and prevents NK cell-mediated lysis. J. Immunol. 164: 5019–5022.
. 1988. Human cytomegalovirus encodes a glycoprotein homologous to MHC class-I antigens. Nature 331: 269–272.
. 2008. Human cytomegalovirus regulates surface expression of the viral protein UL18 by means of two motifs present in the cytoplasmic tail. J. Immunol. 180: 969–979.
. 1997. A novel immunoglobulin superfamily receptor for cellular and viral MHC class I molecules. Immunity 7: 273–282.
. 1999. The inhibitory receptor LIR-1 uses a common binding interaction to recognize class I MHC molecules and the viral homolog UL18. Immunity 11: 603–613.
. 2007. The human cytomegalovirus MHC class I homolog UL18 inhibits LIR-1+ but activates LIR-1- NK cells. J. Immunol. 178: 4473–4481.
. 2005. Downregulation of natural killer cell-activating ligand CD155 by human cytomegalovirus UL141. Nat. Immunol. 6: 181–188.
. 2009. Beyond Stressed Self: Evidence for NKG2D Ligand Expression on Healthy Cells. Curr. Immunol. Rev. 5: 22–34.
. 2006. Regulation of NKG2D ligand gene expression. Hum. Immunol. 67: 159–169.
. 2001. ULBPs, novel MHC class I-related molecules, bind to CMV glycoprotein UL16 and stimulate NK cytotoxicity through the NKG2D receptor. Immunity 14: 123–133.
. 2009. ULBP6/RAET1L is an additional human NKG2D ligand. Eur. J. Immunol. 39: 3207–3216.
. 2003. Effects of human cytomegalovirus infection on ligands for the activating NKG2D receptor of NK cells: up-regulation of UL16-binding protein (ULBP)1 and ULBP2 is counteracted by the viral UL16 protein. J. Immunol. 171: 902–908.
. 2003. Human cytomegalovirus glycoprotein UL16 causes intracellular sequestration of NKG2D ligands, protecting against natural killer cell cytotoxicity. J. Exp. Med. 197: 1427–1439.
. 2008. Human microRNAs regulate stress-induced immune responses mediated by the receptor NKG2D. Nat. Immunol. 9: 1065–1073.
. 2009. Diverse herpesvirus microRNAs target the stress-induced immune ligand MICB to escape recognition by natural killer cells. Cell Host Microbe 5: 376–385.
. 2006. Down-regulation of the NKG2D ligand MICA by the human cytomegalovirus glycoprotein UL142. Biochem. Biophys. Res. Commun. 346: 175–181.
. 2005. Effect of human cytomegalovirus on expression of MHC class I-related chains A. J. Immunol. 174: 3098–3104.
. 2009. High-throughput sequence analysis of variants of human cytomegalovirus strains Towne and AD169. J. Gen. Virol. 90: 2375–2380.
. 2004. Genetic content of wild-type human cytomegalovirus. J. Gen. Virol. 85: 1301–1312.
. 2005. Human cytomegalovirus encodes an MHC class I-like molecule (UL142) that functions to inhibit NK cell lysis. J. Immunol. 175: 7457–7465.
. 2009. NKG2D ligand MICA is retained in the cis-Golgi apparatus by human cytomegalovirus protein UL142. J. Virol. 83: 12345–12354.
. 1999. Population study of allelic diversity in the human MHC class I-related MIC-A gene. Immunogenetics 49: 605–612.
. 2008. Modulation of natural killer cells by human cytomegalovirus. J. Clin. Virol. 41: 206–212.
. 2005. NK cell activation through the NKG2D ligand MULT-1 is selectively prevented by the glycoprotein encoded by mouse cytomegalovirus gene m145. J. Exp. Med. 201: 211–220.
. 2003. NKG2D-mediated natural killer cell protection against cytomegalovirus is impaired by viral gp40 modulation of retinoic acid early inducible 1 gene molecules. J. Exp. Med. 197: 1245–1253.
. 2005. Selective down-regulation of the NKG2D ligand H60 by mouse cytomegalovirus m155 glycoprotein. J. Virol. 79: 2920–2930.
. 2004. The cytomegalovirus m155 gene product subverts natural killer cell antiviral protection by disruption of H60-NKG2D interactions. J. Exp. Med. 200: 1075–1081.
. 1994. Identification and expression of a murine cytomegalovirus early gene coding for an Fc receptor. J. Virol. 68: 7757–7765.
. 2006. The herpesviral Fc receptor fcr-1 down-regulates the NKG2D ligands MULT-1 and H60. J. Exp. Med. 203: 1843–1850.
. 2009. Differential susceptibility of RAE-1 isoforms to mouse cytomegalovirus. J. Virol. 83: 8198–8207.
. 2009. Differential NKG2D binding to highly related human NKG2D ligands ULBP2 and RAET1G is determined by a single amino acid in the alpha2 domain. Eur. J. Immunol. 39: 1642–1651.
. 2008. Natural-killer cell ligands at the maternal-fetal interface: UL-16 binding proteins, MHC class-I chain related molecules, HLA-F and CD48. Hum. Reprod. 23: 2535–2548.
. 2004. Two human ULBP/RAET1 molecules with transmembrane regions are ligands for NKG2D. J. Immunol. 173: 1078–1084.
. 2006. Selective export of HLA-F by its cytoplasmic tail. J. Immunol. 176: 6464–6472.
. 2003. Selective intracellular retention of virally induced NKG2D ligands by the human cytomegalovirus UL16 glycoprotein. Eur. J. Immunol. 33: 194–203. 2008. Evolutionary struggles between NK cells and viruses. Nat. Rev. Immunol. 8: 259–268.
. 2007. Promiscuity and the single receptor: NKG2D. Nat. Rev. Immunol. 7: 737–744.
. 2010. Structure of the HCMV UL16-MICB complex elucidates select binding of a viral immunoevasin to diverse NKG2D ligands. PLoS Pathog. 6: e1000723.
. 2001. Typing for all known MICA alleles by group-specific PCR and SSOP. Hum. Immunol. 62: 620–631.
. 2003. Thermodynamic analysis of degenerate recognition by the NKG2D immunoreceptor: not induced fit but rigid adaptation. Immunity 19: 803–812.
. 2001. Molecular competition for NKG2D: H60 and RAE1 compete unequally for NKG2D with dominance of H60. Immunity 15: 201–211.
. 2002. UL16-binding proteins, novel MHC class I-related proteins, bind to NKG2D and activate multiple signaling pathways in primary NK cells. J. Immunol. 168: 671–679.
. 2007. HIV modulates the expression of ligands important in triggering natural killer cell cytotoxic responses on infected primary T-cell blasts. Blood 110: 1207–1214.
. 2007. Human immunodeficiency virus 1 Nef protein downmodulates the ligands of the activating receptor NKG2D and inhibits natural killer cell-mediated cytotoxicity. J. Gen. Virol. 88: 242–250.
. 2008. Hepatitis C virus infection downregulates the ligands of the activating receptor NKG2D. Cell. Mol. Immunol. 5: 475–478.
. 2009. Herpes simplex virus infection downmodulates NKG2D ligand expression. Scand. J. Immunol. 69: 429–436.
. 2001. Costimulation of CD8alphabeta T cells by NKG2D via engagement by MIC induced on virus-infected cells. Nat. Immunol. 2: 255–260.
. 2004. Role of NKG2D signaling in the cytotoxicity of activated and expanded CD8+ T cells. Blood 103: 3065–3072.
. 2010. Killer dendritic cells and their potential for cancer immunotherapy. Cancer Immunol. Immunother. 59: 1–11.
. 1996. A subclass of dendritic cells kills CD4 T cells via Fas/Fas-ligand-induced apoptosis. J. Exp. Med. 183: 1789–1796.